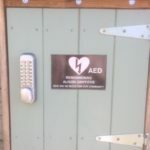 There is a community defibrillator at the Moody Cow which is available for anyone to use in an emergency. The Moody Cow initiated the purchase of a community defibrillator for the village, and local residents have been trained how to use it by West Midlands Ambulance Service. The unit has been dedicated to Alison Griffiths; as Alison did so much for the community. Chris and Dawn at the Moody Cow funded the defibrillator and were touched to receive generous donations towards it from Alison’s family. An anonymous Upton Bishop donor has has agreed to fund the ongoing cost of consumables.